As tennis legends battle it out on the iconic blue courts at this year’s Australian Open, people all around the country are hooked to their screens. The event at Melbourne’s famous Rod Laver Arena is this year upping its total prize pool to a record $62.5 million, up 14 per cent from last year’s competition. Given the singles champions take home $4.1 million, it’s no surprise the sport’s best are giving it their all to take home the coveted trophies. But the impressive winnings aren’t the only cash cow at the Australian Open. Rod Laver Arena itself contains millions of dollars of hidden value for investors in the form of depreciation. Depreciation is the natural wear and tear that occurs to a building and its contained assets over time. Legislation governed by the Australian Taxation Office (ATO) allows owners of income producing properties to claim a tax deduction for this wear and tear. This deduction essentially reduces taxable income for investors, meaning they pay less tax. The ATO defines two different depreciation categories under which investors can make claims. This includes Division 43 capital works allowance covering the property’s structure and fixed assets and Division 40 plant and equipment covering easily removable fixtures and fittings. Depreciation deductions apply to both residential and commercial properties and significantly reduce the holding costs involved with owning an investment property. Rod Laver Arena is a spectacle in itself, fitted out with state of the art recording technology, impressive stage infrastructure and its very own cafes and bars. It’s no surprise that the total build cost was $94 million back in 1987. 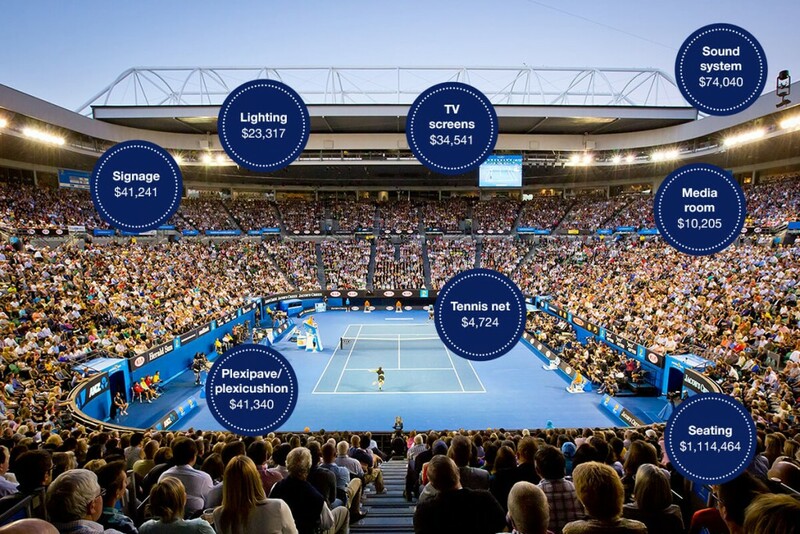 With such high-value assets, Rod Laver Arena attracts remarkable depreciation deductions. The infographic below outlines the first full financial year deductions for some items within the Arena. Click the image to expand. These assets alone make up a first year deduction of $1,343,872. Keep in mind that this is just a selection of assets found within the arena and the deduction is therefore not exhaustive. A comprehensive tax depreciation schedule is the only way to ensure your depreciation claim is maximised and every possible dollar is captured. BMT Tax Depreciation have prepared more than 600,000 schedules for a range of residential and commercial buildings to help their owners get the most back from their investments. For an obligation free quote tailored to your residential or commercial investment property, request a quote or call 1300 728 726.